In this 45 minute radio interview, we talk with Booker winning novelist Alan Hollinghurst about The Stranger’s Child, how a single verb can alter a sentence, and whether literary biographies have any legitimacy. 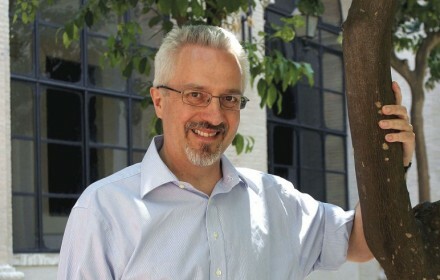 Alan Hollinghurst appeared on The Bat Segundo Show #422. He is most recently the author of The Stranger’s Child. Condition of Mr. Segundo: Pondering a new career that has nothing to do with literary biography. Subjects Discussed: Ivy Compton-Burnett, attention to character panoramas in 21st century literature, the appeal of huge gaps in the narrative, Alice Munro’s Runaway, how Hollinghurst decides which characters get to pop up later, Chekhov’s gun, characters who have affairs with the same man, factoring in the reader’s need to know, The Line of Beauty, Michael Apted’s Up series, unanticipated flourishes that run throughout different historical epochs, the 1967 Sexual Offenses Act, avoiding writing directly about the Great War, the dangers of too much research, the James Wood review, how a single verb choice can alter a sentence, “muddle,” the paucity of laughter verbs in English, our correspondent’s highly pedantic (and unsuccessful) attempt to pinpoint Hollinghurst’s affinity for verbs containing the letter U, Paul Bryant as one of the most compelling cases against literary biography and literary criticism, real world Paul Bryants, how minor biographies are often written by the wrong people, Ronald Firbank, obsessiveness as a character trait, media overexposure, being comfortable with the inevitability of obsolescence, fiction and posterity, Auden and biography, Mick Imlah’s “In Memoriam Alfred Lord Tennyson,” legitimate literary biography, Michael Holroyd’s work on Lytton Strachey, Richard Ellmann’s Joyce bio, the fallibility of human memory, the corruption of poetry, the allure of the second-rate, life vs. art, having a vivid sense of someone over a weekend but not really knowing them, The Man Who Shot Liberty Valance, referential character names, why Hollinghurst couldn’t get through the whole of Anthony Powell’s A Dance to the Music of Time, depicting older people, having a wide range of friends, The Swimming-Pool Library, relationships between young and old people, sticking with “said” in dialogue and appending description, Evelyn Waugh, dealing with idiosyncratic translations, the word “satiric” offered as a cue for later satirical exercises, loose environmental description, jostling characters around, class trappings, TS Eliot and PG Wodehouse’s past experience as bankers, growing up with a father who was a bank manager, and Hollinghurst’s novels increasingly moving further into the past. Correspondent: In the first section, we are informed that Cecil’s servant cleans his change. Later in the book, you have Paul Bryant, who I want to talk about quite a bit — he works in a bank and he washes the money smell off of his hands in the gent’s room. Then you give Cecil a very firm handshake. And then in the third part, you have Paul with his bandaged hand. So there are these interesting historical parallels, historical contrasts, that I detected. And I’m curious how many of these you calculated in the book. Hollinghurst: Well, you’re a wonderfully observant reader, I must say. I hadn’t actually been struck by the fact of the bandaged hand and the firm handshake. Yes, a great deal has been made of Cecil’s hands being very large. He’s always climbing up mountains and rowing boats and things. And seducing people with them. I mean, one is always cleverer than one knows, of course. Hollinghurst: (laughs) One’s unconscious is just happily seeding all sorts of little details of that kind, which I may not have actually calculated. It’s always very gratifying when they’re picked up by reviewers, if they were fully conscious. But truly they’re often not. Correspondent: Well, I’m curious. The five part structure. To what extent was this motivated by knowing the characters in advance? Or did you just know the historical settings in advance? Hollinghurst: Did I know when I started what the different periods were going to be? Correspondent: Well, that, and also did, for example, considering the characters and how they would evolve determine when you set those particular parts? Hollinghurst: Possibly, yes. I mean, the first and third sections in particular happened on the eve of very significant things for their lives. The first section is on the eve of the summer before the Great War. And the 1967 section happens just before the passing of the Sexual Offenses Bill in England, which decriminalized homosexuality or homosexual acts between two consenting adults in private. Correspondent: And the course of your book is post-Wilde as well. So there you go. Hollinghurst: Exactly. So those dates were both significant. Partly these gaps are a way of avoiding writing about things such as the Great War and so on. Which I knew I didn’t want to write about. And I know that what I always wanted to write about really was the more intimate lives of sometimes slightly strange people. Rather than large heavily researched panoramic sorts of things. You know, the Great War has been so wonderfully well written about by people who were in it and by people since. That’s just not the kind of writer I am, I think. But I like the idea of writing scenes that the reader would know what was overshadowed by historically imminent things. Correspondent: But most importantly, it’s a very skillful way to avoid long years of research to these battles. Correspondent: I mean, most of these scenes — most of the settings are inside. And very often, we get these wonderful descriptions of architecture and the like. So I’m wondering if setting much of the novel indoors, in specific area, was a strategy to avoid perhaps this obsessiveness that would in fact go on to researching obscure details. Hollinghurst: Yes. I think that may be right. There’s something defensively domestic about the whole scale of the book. I mean, it’s a large book in a way. It covers a long period. But I think it is domestic in scale. Correspondent: This leads me to ask you about how often in your sentences a verb will transform something that is normal into something that becomes beautiful and intoxicating. One example. There’s one sentence where you have a servant pour soup into a bowl. And instead of saying “pour,” you use “swim.” And I became obsessed with this verb. How that one verb choice transforms the entire sentence. And it gives you this completely different look at an ordinary action. And this leads me to ask you. How much do you agonize over a verb choice? Like something like that. Hollinghurst: I can’t remember that particular one. Well, I do write very, very slowly, as you probably realized. So I wouldn’t generally write more — you know, on a good day, two or three hundred words. It’s not quite agony. Because it’s actually very exciting and gratifying when it goes well. And as you say, when I surprise myself by a choice for a word. Which I think is probably an improvement on the obvious one. Correspondent: Deliberation. Okay, so there’s this James Wood review in The New Yorker of your book. And I thought that it was a little on the silly side. Because he was going on about how you use the word “muddle” repeatedly. And I asked some friends, “Do you honestly are how often Hollinghurst uses muddle?” But this also leads me to ask you. I mean, when you have the entire book done, do you go through the entire manuscript hoping you don’t use the same word multiple times? Or is there a conscious choice to use a word like muddle? Or how much does this matter to you? I’m curious. Hollinghurst: “Muddle” I was entirely conscious of. Yes. So it’s rather galling then to have it put back into something. Hollinghurst: Yes. It was ridiculous. The schoolmaster like had a finger wagging. Yes, I think it’s very interesting. I think each stage — because I write things in longhand in the first place. And then I put onto them and print them out. And then they go into the proof. But at each stage, new things rise to the surface. And you’re aware of new patterns. Hollinghurst: Recurrences of words. I mean, the first time I printed this out and it was read — I mean, I wasn’t aware of it. But a great friend of mine noted the word “chuckle.” “Frown” and “chuckle” appeared and alternated. Sometimes people frowning and chuckling even at the same time. So I had to go through. There’s a terrible paucity of laughter verbs in English. I mean, “chuckle” doesn’t really have an easy equivalent. And I think I perhaps replaced one or two of them with “giggle.” And then I had to do a “giggle” purge as well. I think there are things that one is not quite in control of. But “muddle” was a word I was very consciously using. Because in a way, it’s what the whole book is about. “Muddle” is also consciously Forsterian.